to return to Herod, they left for their own country by another path". Life of the Virgin as well as the Life of Christ. 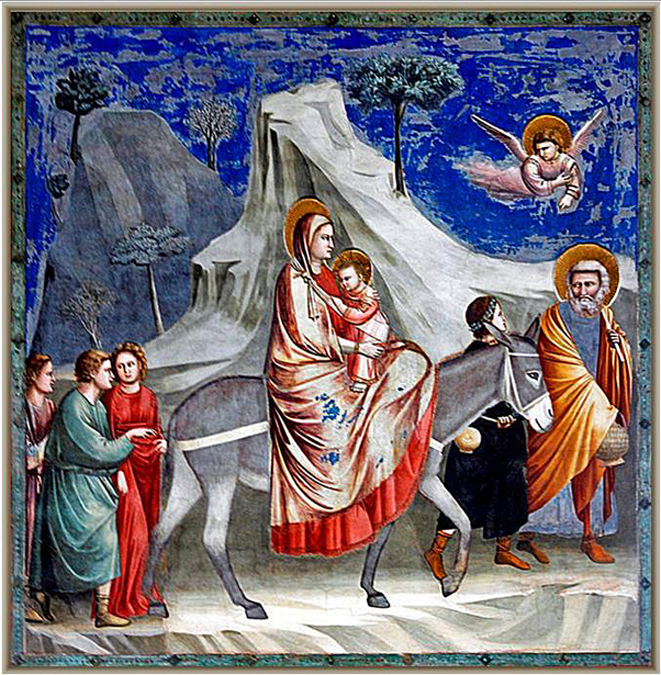 In the church calendar, the event is commemorated in Western Christianity as the Feast of the Epiphany (January 6). have been placed under the panel of the Virgin and Child, now in the National Gallery, London. was a common component in cycles of the Life of the Virgin as well as the Life of Christ. to Joseph in a dream and warns him to take Jesus and his mother into Egypt (Matthew 2:13). limestone, water and pigments, which were inexpensive and therefore inoffensive to religious figures. following the stories of the Bible in the form of didactic art. Giotto, Arena (Scrovegni) Chapel, Padua, from Smarthistory, art, history, conversation on YouTube. the most widely analyzed works in Western painting. queen. 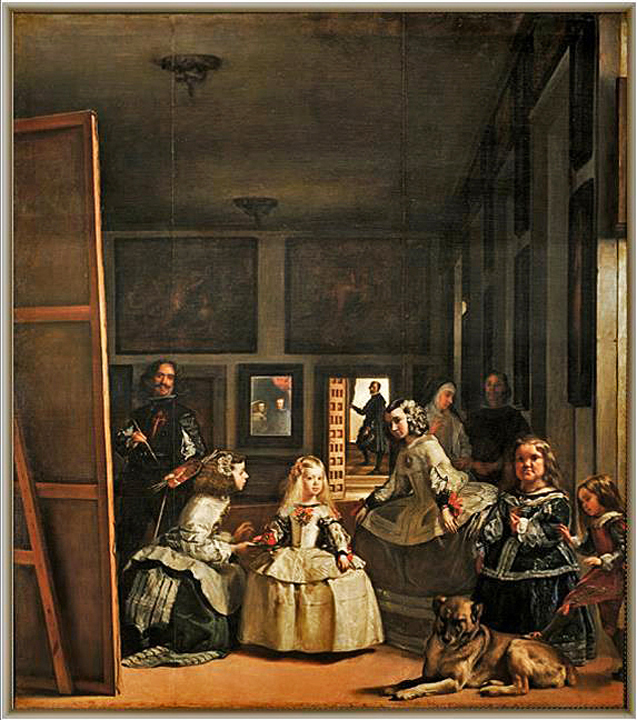 Some scholars have speculated that their image is a reflection from the painting Velázquez is shown working on. supreme achievement, a highly self-conscious, calculated demonstration of what painting could achieve. Ulloa, the princess's chaperone, dressed in mourning and talking to an unidentified bodyguard (or guardadamas). the pose they are holding for Velázquez as he paints them. referred to by more descriptive (though incorrect) titles, such as 'The Soft Watches' or 'The Melting Watches'. The well-known piece introduced the image of the soft melting pocket watch. 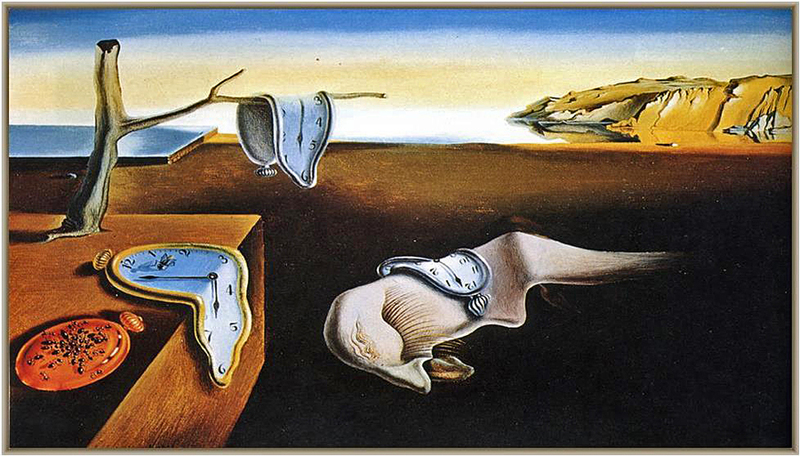 It epitomizes Dalí's theory of "softness"
sleep or the persistence of time in the eyes of the dreamer. found in dreams than in waking consciousness. work of art ever sold. gamblers in taverns, replacing them instead with stone-faced tradesmen in a more simplified setting. 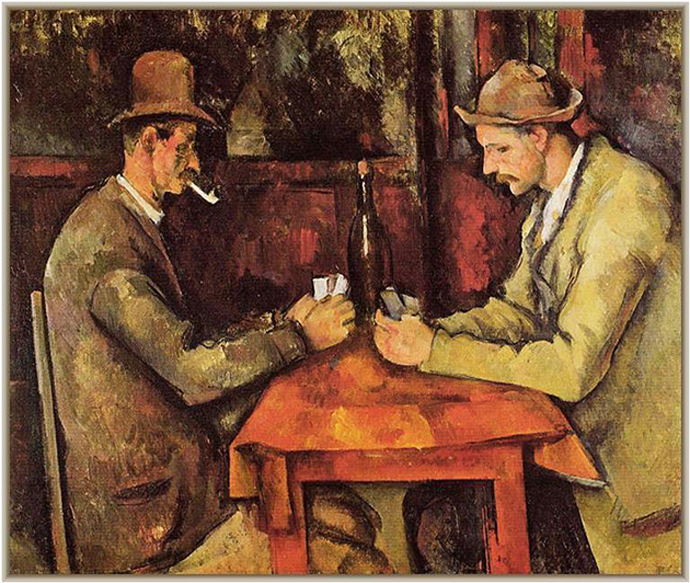 card players and is widely cited as an inspiration for the works by Cézanne. 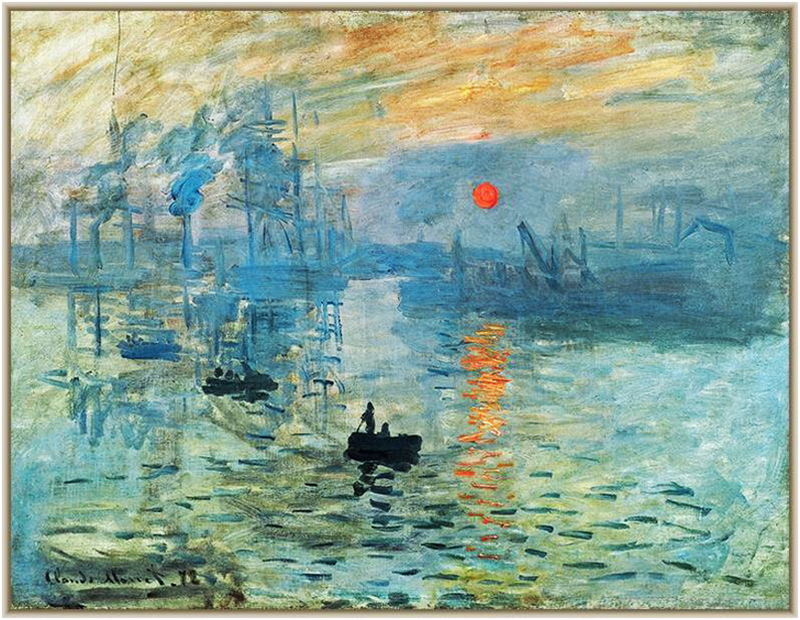 Impression, Sunrise depicts the port of Le Havre, Monet's hometown, and is his most famous painting of the harbor. lacking descriptive detail, but Monet received these criticisms regardless of the title. rippling water, as the silhouettes of the boats seem to be disappearing into the mist. Bacon's studio, and at night as an illicit casino. he was to admit that he hardly knew what he was doing, though he believed that alcohol had loosened his style. background of visceral oranges, reds and blacks, marks a watershed in British painting. paintings that pre-dated the Three Studies. to reveal its teeth, as if in the grips of some bestial orgasmic spasm. work is to painting what Sartre's Huis Clos is to literature; a paean to existential despair. she took hold of the hair of his head." (Judith, 13:7-8). bloodstained head on the battlements of Bethulia puts the enemy to flight. color crowns the act of murder as well as the heroine's triumph. 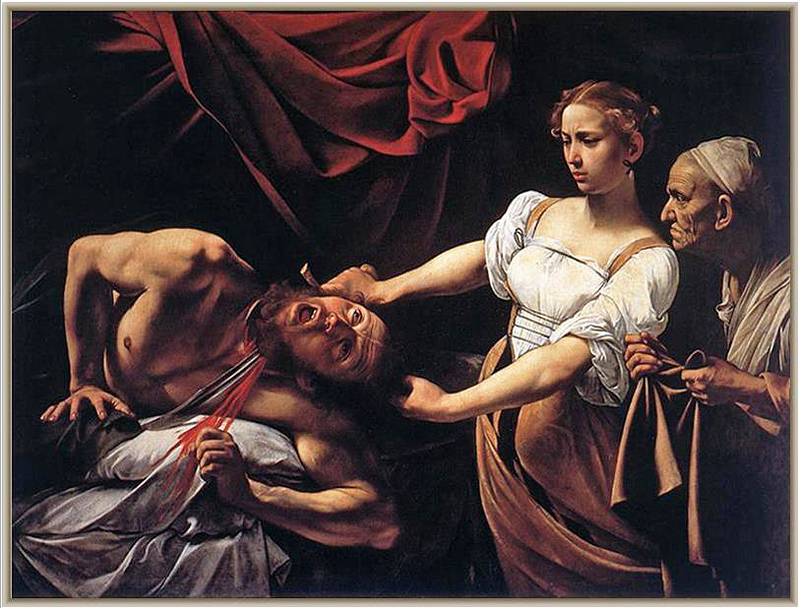 Judith Beheading Holofernes from Classical Harmony on YouTube.